2. 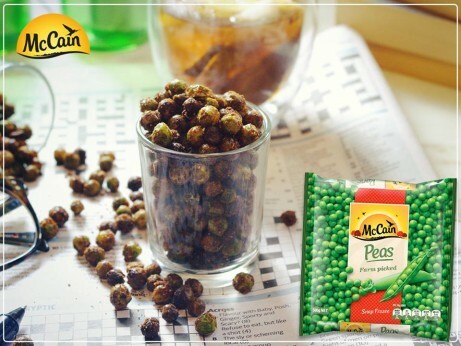 Completely thaw McCain Peas, and blot with paper towel to remove any excess moisture. This will ensure your roasted peas are crunchy. 3. Combine spices and salt in a mixing bowl, add McCain Peas and toss to coat. Evenly spread peas on lined roasting tray. Drizzle with olive oil and roast for 30-40 minutes, shaking the tray every 10 minutes so they roast evenly. 4. Remove peas from oven and allow to fully cool before serving. The peas will crisp up as they cool down. 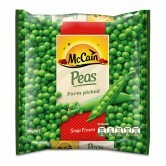 2 Completely thaw McCain Peas, and blot with paper towel to remove any excess moisture. This will ensure your roasted peas are crunchy. 3 Combine spices and salt in a mixing bowl, add McCain Peas and toss to coat. Evenly spread peas on lined roasting tray. Drizzle with olive oil and roast for 30-40 minutes, shaking the tray every 10 minutes so they roast evenly. 4 Remove peas from oven and allow to fully cool before serving. The peas will crisp up as they cool down.